The next day Adam and I woke up bright early (for me anyways) and set off for the Kingston Penitentiary. 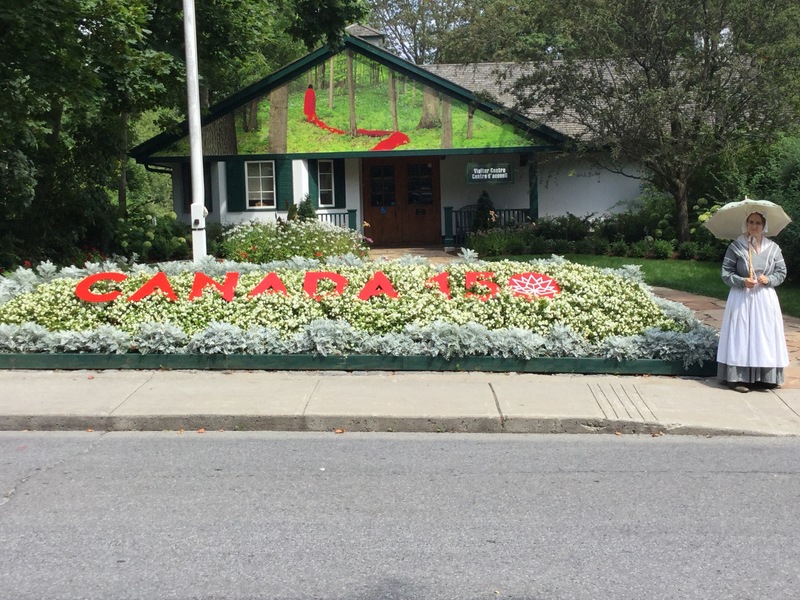 I have to say that if you do visit Kingston, this is a MUST SEE! Adam even enjoyed himself, which is hard to do when it comes to history and touring. We were ushered into a waiting room with chairs lined up against two walls and had to sign release forms as to not sue the prison or be offended by the graffiti on the walls (some of it was horrible and I’m not repeating). 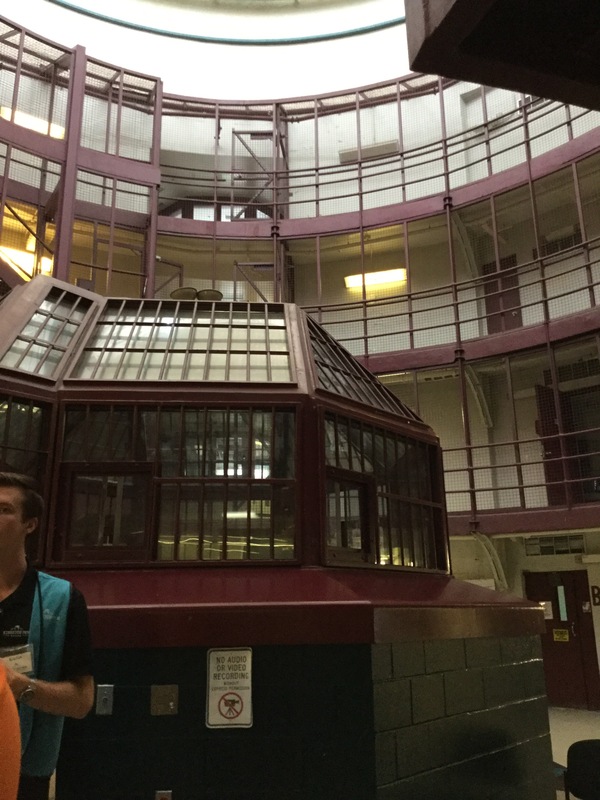 For a while, it felt like we were visiting an inmate on the inside :s. We did the basic tour, just to get a glimpse of the prison. Once our group was assembled, we went into another room where it used to be an open visitation; about 5 tables in a small room and a corner for kids to play. The tables were all made of glass so the guards could see if anything was being done “under the table”. They also had microphones in the table centre so the guards could hear of anything illegal or any plans going on. The tables had been removed since the tours opened, but pictures on the walls showed what it used to be like. Then we quickly walked passed the closed visitation where it’s a desk with two chairs on both sides and a glass wall in between with phones on each side (think of Legally Blonde). Then we were taken to the long term visit houses where inmates (with no history of violence to women, sexual crimes, or child crimes) got to stay in a row house furnished with 2-3 bedrooms, bathroom, kitchen, laundry room. This was to encourage the children to see their fathers and keep a bond with them. We were told it was also for inmates who had been in prison for so long, that they forgot to do simple mundane tasks like cleaning, cooking, laundry, etc. They would put one inmate in each room of a house to live for a few days to get them used to going on the outside and learn to be a functioning law abiding citizen. We were taken into “the dome”, a rotunda room that had landings all around the wall with a hut in the middle of the room for guards. This is where during the 1971 riots, the “undesirables” were beaten, some to death. The hut wasn’t built until the early 2000’s but they said it was a platform room inside with windows all around (able to watch everything going on) that had a trap door in the floor to a cellar like area that houses weapons in case riots or anything horrible happened. We were toured around by a guide and stopped along the way to hear stories from ex-guards and some from the time of the riot. 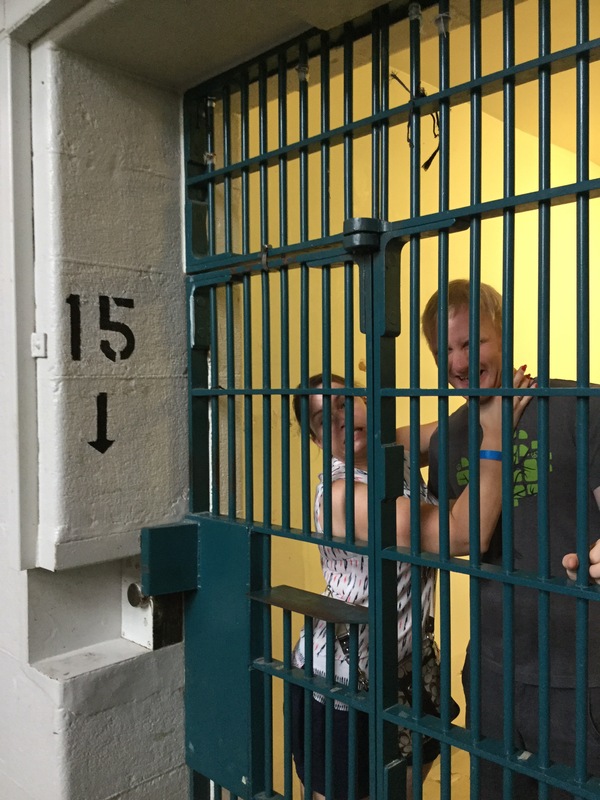 We were able to go in some of the cells to see how small and compact they are. This is where we saw a lot of graffiti as it is where they spent most of their time. Some of the ceilings in the cells had murals painted on them. We asked how they got the paint, but out of all things that sneak into prison (drugs, weapons, tattoo guns?) paint is the least of their worries. 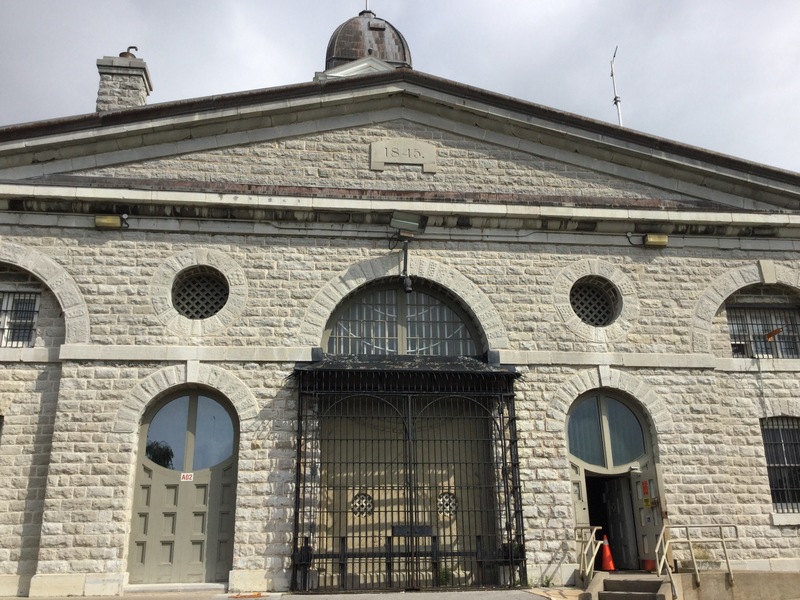 They said when prisoners knew that Kingston Pen (KP) was shutting down, the guards were a little more lenient about letting them paint their “homes” that they were leaving. We also got to see the cells that were apparently the ones Paul Bernardo was in for 23 hours a day. They told us at the beginning that they wouldn’t give out any details on ex-prisoners of KP as it goes against the privacy act, but we did have an active prison guard (from another prison) who was giving the group little tidbits on what he’s heard from guards who worked at KP. It was a very interesting at KP, but I wonder if we should have done a longer, more in depth tour. If we ever go again, I’m doing the extended one in a heartbeat! Directly in front of KP was the old Warden’s house that had been turned into the Corrections Service Museum of Canada. This was free to the public with a donation box at the front. It was interesting as well but mostly because it showed a replica or the size of cells when the prison was first built (which wasn’t even enough room width-wise for a single bed). In the old cells, they had a dummy sleeping in bed and I nearly (probably did) wet myself! Then we saw all the shivs and shanks that had been found in the prison; they even had a makeshift cross bow. They also had the remains of a failed escape attempt. An inmate had glued together dirty meal trays (to be washed) and cut out the centre to make a box for himself to hide in. Adam and I were thinking “how do they come up with this?” but being in prison gives you a lot of time to think I guess and oh lord were they creative with their time. We stayed around thirty minutes but mostly at the weapons area. 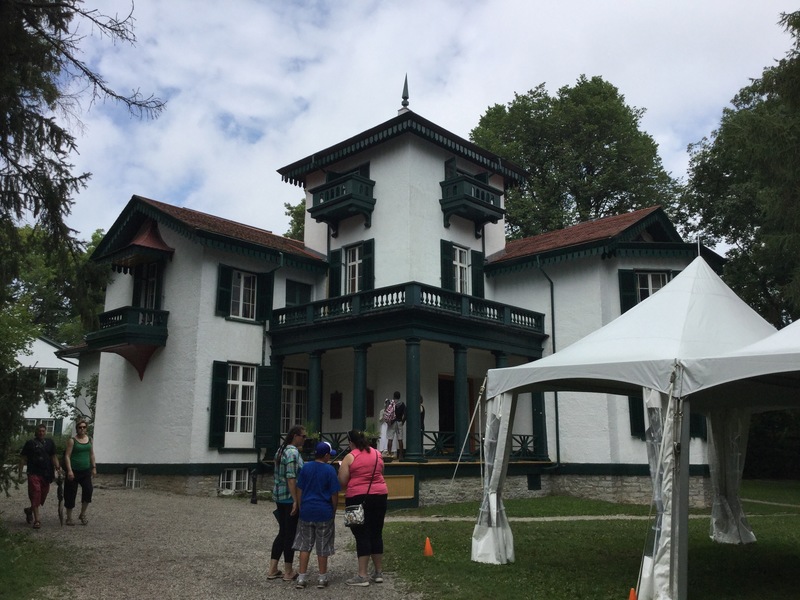 Next we drove down the street to Bellevue House which was Sir John A. MacDonald’s house for a year before he was Prime Minister. We looked online for the Discovery Pass and it said for sure that it would work. So rushing out that morning, I forgot to bring it with me. So we drove all the way back to the hotel and back (about 20 minutes round trip) and got to the museum just to find out we didn’t even need the Discovery Pass because they were letting everyone in for free even if you didn’t have the pass. All that time and driving for nothing! I wanted to show it just so I could feel special (I got a lot of eye rolling from Adam at this point lol). You park across the street (free) and are met at the front gates by a girl dressed in the full dress with crinoline and bonnet. It must have been 35°C outside and we were dying in shirts and shorts I don’t know how she did it (but at least she had the parasol, that’s all that matters lol). We went inside and saw a small room with a few things on the walls. We weren’t really told where to go so I said to Adam “well if this is it, I’m glad we didn’t pay”. Annnnnnnd it was just the visitor centre thank god. So we had to walk down the street a bit to the house, along a green picket fence with apple trees in the yard. Inside was nice, big house; I think there were technically 5 stories including the study that has 3 steps leading up to the room. We were told most of the objects in the house were not from the MacDonald’s but were from the time period. There were ladies dressed the same as the girl outside in heavy dresses wanting to tell you more about the house. We were talking to one lady and then turned to go to the basement. There was a little door, about the size of my hand, on the wall on the stairs. I coyly tried to be nosey and open the door to see what was behind it but the lady caught me! She’s like “It’s just to hide an outlet behind. We were trying to hide it but it seems to draw more attention than we actually wanted.” I laughed and walked down the stairs and said to Adam “Damn she caught me!” lol. So we went outside to the gardens and saw two people working on the vegetable garden. There were tomatoes, dill, squash, pumpkins, etc. growing. We saw one woman hoeing the dirt said she was planting (kale) and I asked what happens to the vegetables once they have been harvested. She said they were sent to a shelter for homeless or needy (not too sure which organization she said) but it was going to a good place. She asked if we had a garden at home and if we were growing any vegetables. I said “No, we kill everything we grow. That’s why we don’t have kids” and she kinda gave this look of “OMG why did I ask” and terror but after a while….she laughed. It was only then that I was glad I didn’t say “anymore”. We spent a good hour there; it’s pretty cool to see such a large house well preserved in that era. 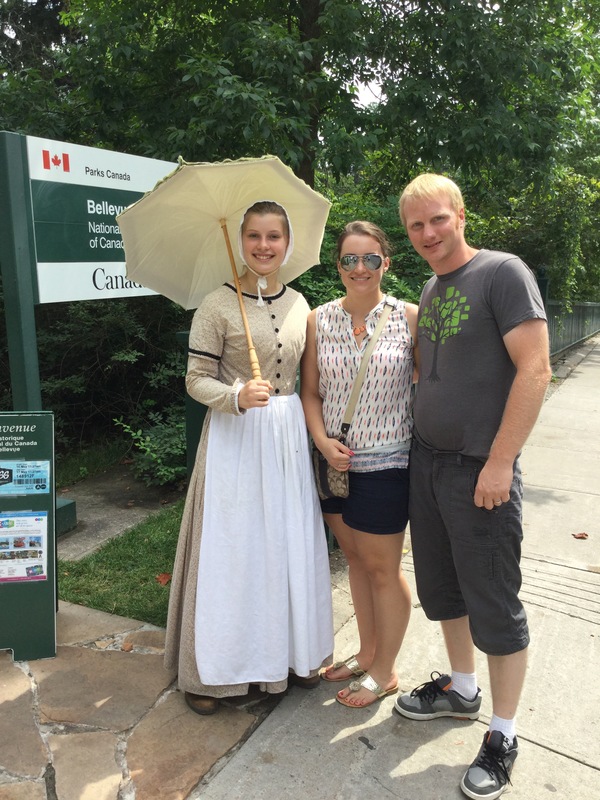 At this point we have kept to a good time schedule (even with the whole fiasco of the Discovery Pass) and drove to Fort Henry on the other side of the Rideau Canal. 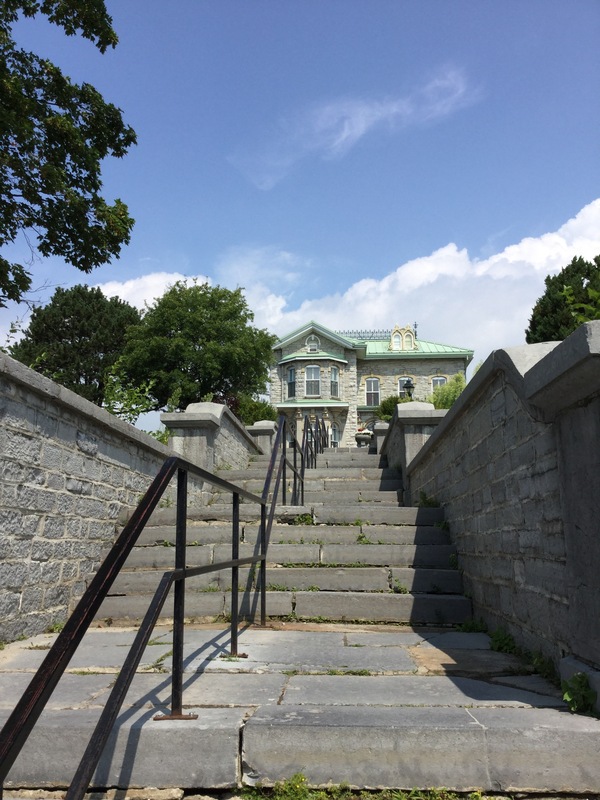 It’s on top of a hill overlooking downtown Kingston and the waterfront and the breeze from the water just whisked away all the humidity and sweat from my brow (in other words, I was line drying for a few minutes). 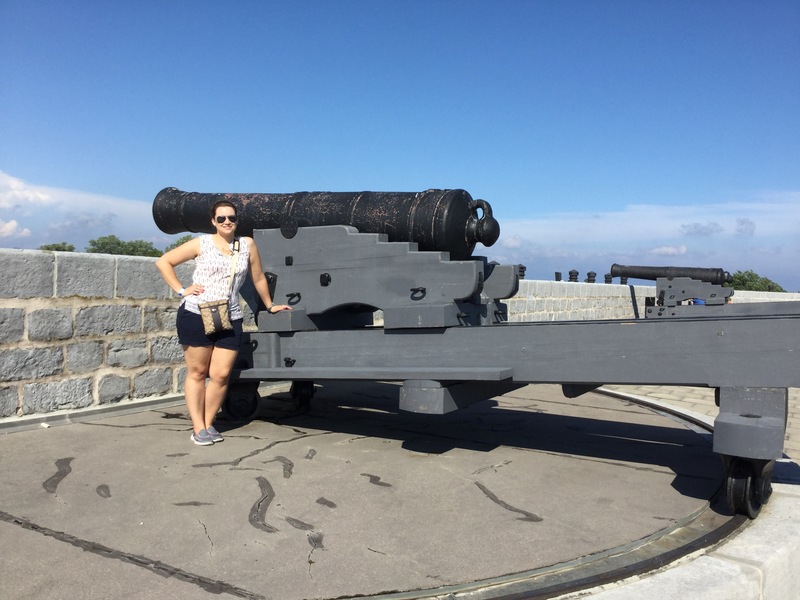 We got there just in time to see the changing of the guard and the firing of the canon.​​​ Hate to say it but if you’ve seen one (at a Fort of the War of 1812) you’ve seen then all, but when in Rome. We watched the drummers do their formation and it was like old school version of the movie Drumline. We had perfect time because we were able to take a guided tour around the fort. Being summer vacation and a weekend, we had a lot of kids on the tour. This is one of the reasons I don’t want kids; the kid who asks all the questions to the guide (and not the smart questions) and interrupts him and and and. Ugh. I know that they have to learn, but Jesus, the tour ran into overtime with all of his questions. We got to see where all the soldiers and the officers lived and how different it was; vast room for one officer vs. slightly smaller room for two dozen soldiers. We were shown a set of stairs that led down to the ammunitions room (I think) and said its open to the public but it’s not on that tour. Also, it’s not good for people who are claustrophobic, buuuuuuut I wanted to try. So after our tour, we B lined it straight to that room and walked down the stairs to find a long, dark, short, narrow hallway dripping (from the limestone) and said nope nope nope. This is how horror movies start…this is how people die…I ain’t dying today! 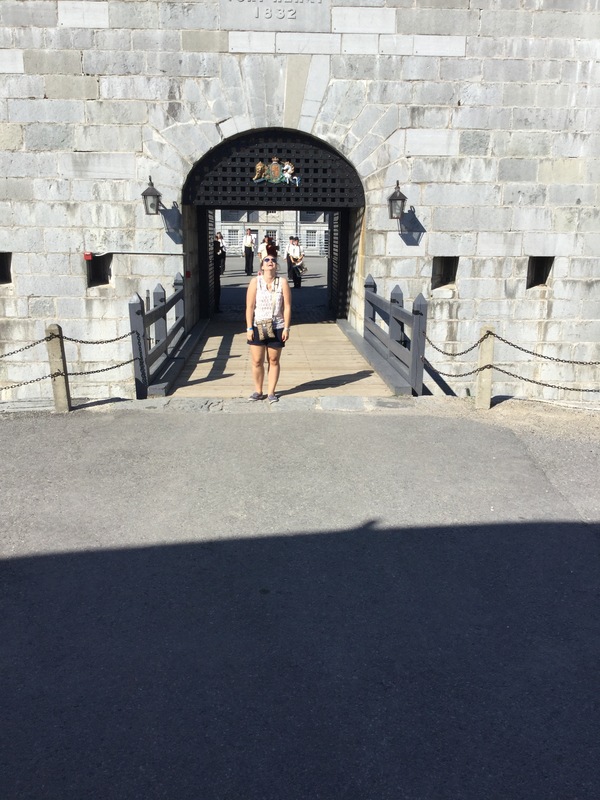 So we cut it pretty close to closing, but we wanted to get a picture each of us in front of the gates into Fort Henry with the soldiers behind us. So I got a great shot of Adam; could see the date stone at the top with Fort Henry above it and the gate and the soldiers. But as we were switching the camera over the final closing canon went off with a loud BOOM! and Adam hit the deck so fast and covered his head (apparently his cold war school drills finally paid off) and all the pictures of me after is me laughing and bending over holding my stomach. And the pictures are all tilted because Adam is laughing as well and can’t keep it together. This had to happen right in front of the soldiers…of course, but I bet they’ve seen everyone flinch (or even hit the deck a few times lol). As it was closing up we decided to go into the little shops within the grounds but outside of the fort. Now I’m not sure if crazy follows me or if I just am listening and people watching more. So Adam and I are walking from one store to another and we felt this terrific breeze woosh passed us. I was thinking “the wind is really picking up now” but only to our horror we saw a woman who has lost control on her electric scooter/wheelchair zoom past us. She only slammed on the brakes about an inch from the stone wall. Adam and I looked at each other and kind of giggled but I guess she started up again and tried to reverse but put in drive and finally crashed into the stone wall. Then we finally lost it. But the difference between Adam and I is I can stifle a laugh, Adam can’t. So as Adam’s face is going bright red and his shoulders are shaking violently, she’s glaring at us. Then she started backing up again and went into the store we were going in. So being aware of her driving record (and continuing from the day not wanting to die) we went into another store and browsed. But as we were immersed in the antiquities of the store we hear the screech of tires on the ground and in the door frame we see “Speedy Gonzalez”. So without getting our ankles destroyed by her ramming into us, we left the store to go to another store, but same thing happened. It was like Stephen King’s story about Christine the car following us and wanting to kill us. But instead of the engine we heard, it’s the tires screeching warning us…she is coming! We spent quite a bit of time here as there are so many rooms to see. The best part was the view from the canons at the top/edge of the fort. We went out for dinner to Red Lobster (after stopping at home for a long nap). We do have a GPS but I don’t know why it’s possessed. It takes us to parking lots in the area, but none that we can walk to the restaurant from or even drive there. So finally after 10 minutes of redirecting, we finally got to Red Lobster. Adam hates seafood but I love it. So he got the Cajun Chicken Alfredo and I got the crab legs. I was flinging the crab leg bits all over the place trying to get them out of the claws. Of course with Adam not liking seafood, he doesn’t see it much even with me. So what do I do, take the empty claws and try to pinch him (you can dress me up but can’t take me anywhere). It came with corn on the cob and growing up near farm land you get used to pretty good corn. Ya this was pretty bad, it’s like it was made of plastic because it left a horrible burnt plastic taste in my mouth after. But other than that, the biscuits made up for the dinner. We headed back to the hotel after we had a full tightly packed day behind us, and as tightly packed day ahead of us. So we became old and passed out at the late hour of 9pm.